If you have hourly workers, your company may be leaking cash unnecessarily. I’m talking about time theft. It can be just as expensive as employees stealing merchandise. Time theft comes in many flavors. One flavor is hours padding. Many employees can rationalize writing 9:00 as the time they started working even if they arrived at 9:07. Since the shift was supposed to start at 9:00, there is little chance of being caught. The stolen minutes don’t cause a red flag when the supervisor approves the time card. Another way employees get paid for time not actually worked is by not clocking out for unpaid breaks. In workplaces where time cards are not scrutinized in light of company policies, this happens all the time. Employers hope they can trust their workers, but surveys reveal that time theft is common in most industries. The most flagrant form of time theft is buddy clocking. This is when a co-worker clocks in for an employee that is not even at the workplace. When an employee is running late, a quick text can alert a co-worker. However, there are many instances where the employee never shows up for any of the shift. Employers pay for time not worked due to human error. Employees forget to write down clock ins on paper timesheets. When the time cards are due, he/she must guesstimate shift start and end times. Memory is fallible. It’s easy to forget exactly when you started working graveyard shift last Friday. So what’s the answer? You could hire more managers. Then you would have more oversight on time and attendance. That is not a viable solution for most small businesses. Small business owners are discovering the advantages of biometrics. A biometric time clock requires a unique physical attribute to enter punches. There are clocks that scan a fingerprint, entire palm, the iris, or even the whole face. The clock captures punches to the minute. Your payroll will be based on actual hours worked instead of guesses or abuses. Biometric technology is cutting-edge. But don’t let that intimidate you. Biometric employee time clocks are easy to install and operate. Which Biometric Time Clock Is Best For My Company? 1. What are my State laws regarding biometric time clocks? Many states including California and New York have enacted privacy laws that limit the type of information an employer can collect. There are clocks that work in dusty and wet environments as well as places with chemicals present. 4. Do your workers wear gloves? An iris scanner would be a good choice. Reducing time theft is only one advantage. If your workplace needs controlled access, biometric time clocks offer the highest level of security. They also prevent duplicate and missed punches. Biometric clocks integrated with a time tracking system offer tools for accruals calculations, overtime alerts, employee self-service HR, and labor law compliance. 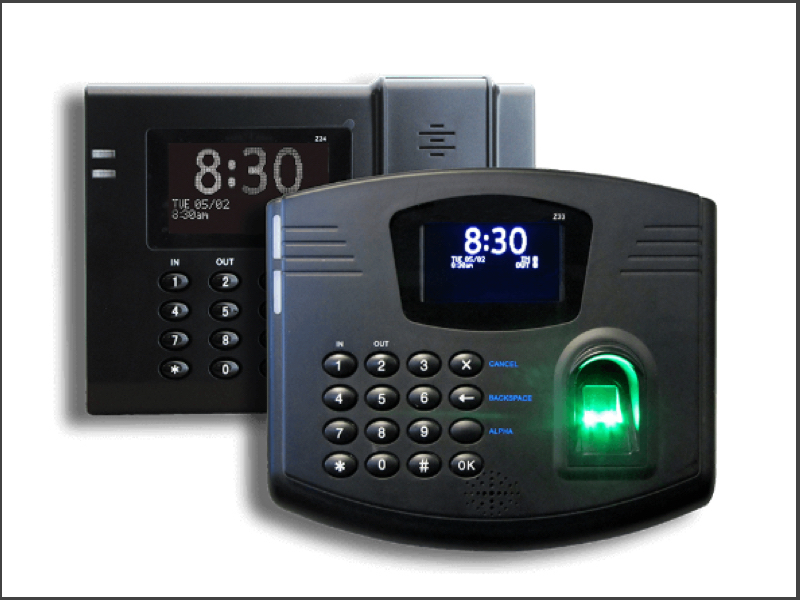 TriCore can help you choose the best biometric time clock for your organization. Call 609-918Â2668 today for a demo.